After downloading, extract the zip file to your desired location, then double click the Keyfreeze icon to run it. A countdown popup message will appear just above the taskbar. 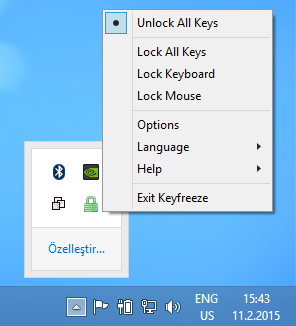 You can right click the Keyfreeze icon in the System Tray to see more options. 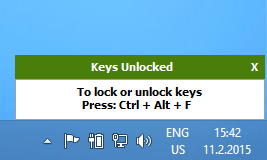 For example, you can lock the mouse or keyboard with a single click. You can customize settings by selecting ‘Options’. 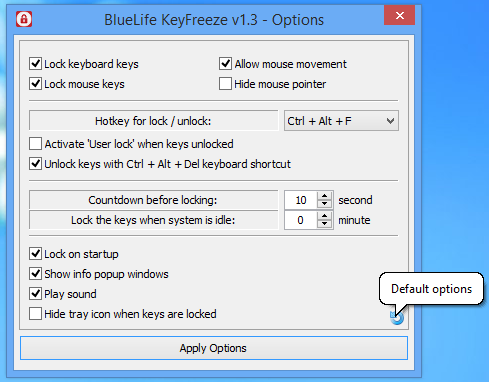 There you can change the lock/unlock keyboard shortcut, disable sounds and popup windows, allow mouse movement, and other settings. 1,384 4,918 Sordum.org <img src="http://www.oldergeeks.com/downloads/gallery/thumbs/keyfreeze1_th.png"border="0"> Jun 25, 2017 - 13:00 1.4 927.4KB ZIP , out of 26 Votes.